In Washington, D.C. this week, we’re awaiting the report from Special Counsel Robert Mueller’s investigation into the role of the Russian government in manipulating public opinion during the 2016 elections. As I’m sure you know, this report will be a pivotal moment for Trump’s presidency, and it’s absolutely critical that the public receives the full details of the investigation’s findings. 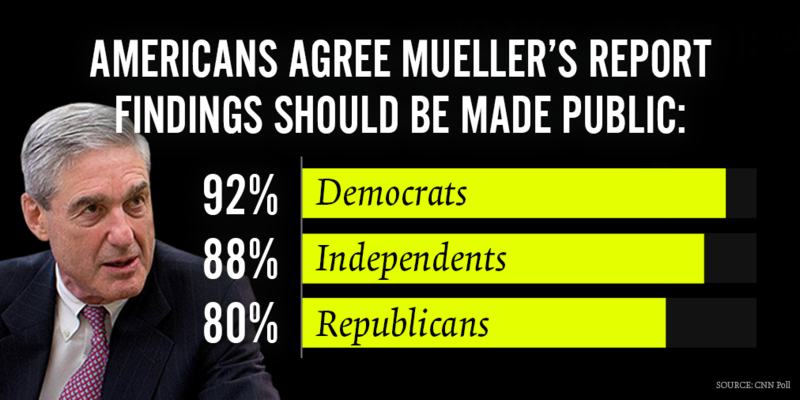 Priority #1 this week: visit ProtectTheInvestigation.org (also on Facebook) and speak out to demand the full disclosure of the Mueller investigation in a public report. On Tuesday morning in the House Transportation & Local Government committee, help SUPPORT House Bill 19-1096, the Colorado Right to Rest Act. This critical piece of legislation acknowledges that the years-log campaign to criminalize homelessness in America has failed, grants homeless people basic rights to exist in public spaces, and prohibits discrimination based on housing status. On Wednesday at 1:30pm in the House Health & Insurance Committee SUPPORT two bills to reduce the cost of health care in Colorado: the Health Care Cost Savings Act of 2019, which will analyze both private and public insurance systems to identify the best path forward for Colorado, and the State Innovation Waiver Reinsurance Program, which would let Colorado apply for federal funding for a reinsurance program to help cover high-cost insurance claims. Passionate about an issue? Want to be heard and have an impact on the legislative process? Learn how to testify before a committee! Testifying on legislation is one of the most powerful ways to be heard at the Capitol. Gena Ozols, NARAL Pro-Choice Colorado’s Political Director will be teaching us to how to navigate this process and give best practices for a successful testimony. Come join us to celebrate 30 years! This year, we will be highlighting three decades of women who’ve worked hard to make Colorado a better place. Our keynote speaker this year is former Speaker of the House Crisanta Duran. Our panel will be moderated by Lauren Casteel, President & CEO of the Women’s Foundation of Colorado. Please join your friends and neighbors for Cory Gardner’s *real* (and last) campaign kickoff in Colorado, on Tuesday at the corner of 19th & Stout, very close to where his Denver office is located. We will have cake, a giant card to sign, and of course Cardboard Cory will be there to take your questions. Stop by anytime between 2-4PM! Free FOOD from Stoke’s Poke! At Chinook Fund, we strive to fund grassroots social justice and community organizing, and want you to hear directly from the community organizers and social justice advocates who are leading the way towards progress and systemic change. We are holding the Grantee Panel in the Posner Center Commons on February 26th to provide an opportunity for the general public to engage with our grantees and hear about the movement building they are doing to advance equality and progress throughout the state of Colorado. What are challenges that come in organizing? What are their strategies in creating system change? What does movement building and organizing look like in the different communities they serve? How do different organizations build power in the communities they work in? These topics and more will be covered during the panel. 87% of Colorado workers don’t have access to paid time off to welcome a new child, care for a sick loved one, or recover from a personal illness. Join 9to5 Colorado and the MSU Feminist Alliance for a screening of Zero Weeks- a documentary on the challenges posed by the absence of a paid family leave policy in our nation. We’ll hear from Colorado advocates about how lack of paid leave disproportionately impacts low-income and working-class women and how they are working to establish a paid family and medical leave program in our state. Colorado should be safe for all Colorado residents, including our immigrant community. Our community members should not fear being in public spaces such as schools, hospitals or universities could lead to their information being handed over to ICE and being ripped away from their families. Virginia’s Law is also designed to ensure that survivors of domestic violence and other victims of crime should feel safe calling the police. In moments of crisis, no one should fear law enforcement for fear of being turned over to ICE. When people aren’t afraid to report crimes to their local law enforcement, it makes all of our communities safer. Frustrated about barriers to health facing our state, but unsure of how you can make a difference? Learn how YOU can influence the policy-making process through the power of your own story, and how to be a key player in the 2019 Legislative session at our Health Advocacy Training. This event is FREE, and dinner is included. Returning activists incredibly welcome! New content will be covered from previous trainings, so you can expect to learn something new! We will also have a breakout group just for our returning activists with even more exciting ways to get involved in your community! Colorado People’s Alliance: House Party How-To! Come join us and learn how to effectively throw a house party for the purpose of fundraising. It’ll be a fun time–you’ll be able to learn important tips and begin to brainstorm! Unsure if you want to host a party by yourself? Come connect with others to plan together! So, you are a white person who considers themselves an ally to black and brown folks. But what does that really mean, and how do you know you are an ally? Are you someone looking to deepen your understanding of oppression, privilege, and your role in combating racism as a white ally beyond your initial introduction into this subject? Then this training is for you. Hello? Denver? Are You Still There? is back with our first episode of 2019! Join me, your host Bree Coco Davies, at Mutiny Information Cafe for our 12th episode, a night devoted to live conversations about the Mile High City that matter. This month, I’m honored to be joined by Terese Howard of Denver Homeless Out Loud & Nathan Davis Hunt from Interfaith Alliance of Colorado! Discuss upcoming environmental bills with representatives from Colorado legislature and environmental advocacy groups. Get organized to support the bills. International Women’s Day has been celebrated in some capacity since 1917, and was officially adopted by the United Nations in 1975. This is a day to celebrate the achievements of ALL women worldwide. We will celebrate in Denver on March 3, 2019 by bringing together women from all backgrounds to showcase their talents, knowledge, and accomplishments. We are planning an afternoon of food, dancing, music, laughter, and a lot of good conversation. Remember to watch your inbox for breaking news and alerts! We’ll see you next week with more ways to fight back.